We were first introduced to this bear on the airplane to Beijing in March. During the 2 hours flight, the in-flight entertainment included some bear clips. Of course we didn't know the name of the bear then, but Kanyon loved it laughing at the bear's misfortune. Flash forward to today when were DVD shopping wishing we could find the unfortunate "Chinese polar bear." Then there he was in 2 disc DVD packs. We bought it, brought it home to Kanyon, and played the discs as we prepared supper. Kanyon still laughs at the bear's misfortune. It reminds me of "America's Funniest Home Videos" beacuse Bernard is always falling, getting hit, having accidents while surfing, driving, sky diving, exercising, fishing, golfing, etc. The episodes are only 3 minutes long. Bernard doesn't speak, nor do the other characters. Bernard is always in some kind of trouble. Bernard is "the polar bear without hair - don't ask what happened! Primitive, selfish, impatient...not only TROUBLE MAKER but TROUBLE FINDER too." 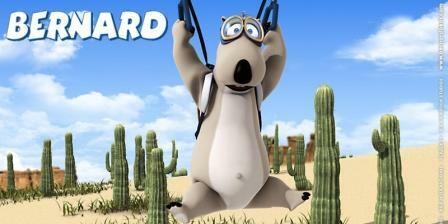 Visit the official website of Bernard Bear.